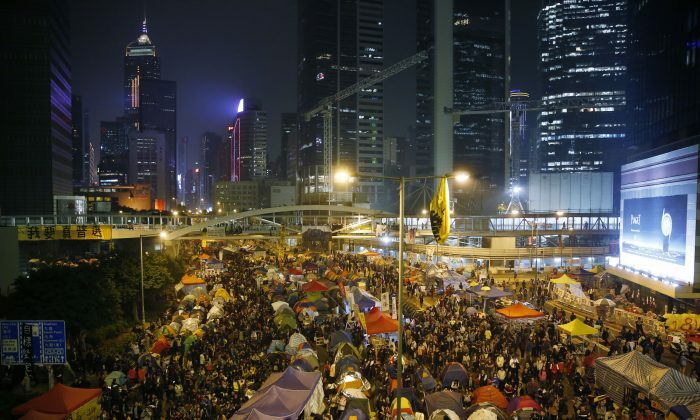 A sizable number of Hong Kong citizens showed up at the recently ended Umbrella protests, a survey reveals. The Center for Communication and Public Opinion Survey at the Chinese University of Hong Kong’s School of Journalism held a telephone poll between Dec. 8 and Dec. 12, and released their findings on Dec. 18. Of the 1,011 Hong Kong residents above the age of 15 surveyed, about 20 percent of respondents said they took part in the protests. This means that about 1.2 million Hongkongers demonstrated in the streets, the Hong Kong Economic Journal extrapolates. More people were against the occupation (42.3 percent of the respondents) than for it (33.9 percent of the respondents). A poll by the University of Hong Kong reveals very similar numbers, with 31.3 percent for and 49.3 percent against the occupation. Chinese University of Hong Kong’s Professor Lee Lap-fung said the CUHK survey results show that Hong Kong residents are consistent in their view of the Umbrella Movement, but don’t agree with the overall strategy. Meanwhile, Ivan Choy, a political commentator at CUHK, says that since a sixth of Hong Kong’s population took to the streets, it shows a strong demand for change that the Hong Kong government cannot casually brush aside, according to Apple Daily. Labor Party lawmaker Lee Cheuk-yan also cautions that the government cannot afford to table a conservative proposal for electoral reform at the second round of public consultations set for next year as it could trigger a strong public outcry. Indeed, the various student groups are already planning to stage protests at the second round of consultations, and are considering non-cooperative actions to keep up the protests for the time being.